Pope Francis today turned his thoughts to the countless children across the world who live in poverty and need. Addressing the crowds in St. Peter’s Square gathered for the weekly General Audience, the Pope continued in his catechesis on the family, focusing this time on children. 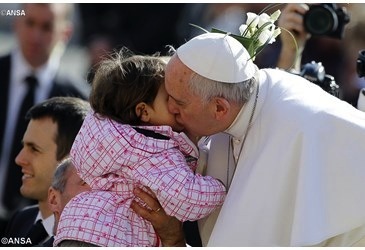 Pope Francis said that children are a great gift for humanity and for the Church. Recalling the many happy children he met during his recent journey to Asia brimming with life and enthusiasm, he said that on the other hand he thinks of the countless children throughout our world who are living in poverty and need. “A society can be judged by the way it treats its children” he said. 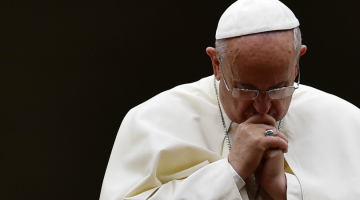 The Pope said that children remind us that from our earliest years we are dependent on others. We see this in Jesus himself, who was born a child in Bethlehem. This – he said – is a precious reminder of the fact the necessary condition to enter the reign of God is to never consider ourselves self-sufficient, but in need of help, love and forgiveness. He said that children also remind us that we are always sons and daughters. This identity – he said – reminds us that we have been given the gift of life, that we never cease to be radically dependent. 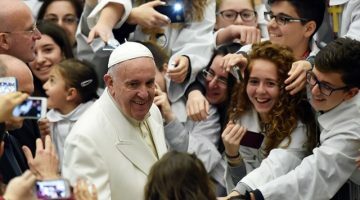 And speaking of the many gifts that children bring to humanity, Francis said they challenge us to see things with a simple, pure and trusting heart. They have the capacity to receive and to offer warmth and “tenderness”, to laugh and cry freely in response to the world around us. And he pointed to a child’s spontaneous trust in his mother and father, in God, Jesus and in Our Lady and said Jesus urges us to become like children, since God’s Kingdom belongs to such as these (cf. Mt 18:3). Pope Francis concluded inviting all to “welcome and treasure our children, who bring so much life, joy and hope to the world”. “How sad and bleak would our world be without them!” he said.